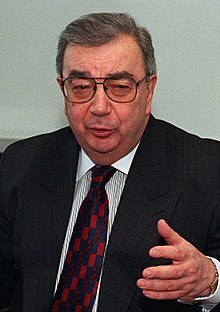 Yevgeny Maksimovich Primakov (Russian: Евге́ний Макси́мович Примако́в, tr. Yevgeniy Maksimovich Primakov; 29 October 1929 – 26 June 2015) was a Russian politician and diplomat. He was the Prime Minister of Russia from 1998 to 1999. Primakov was born to a partly Jewish family (his mother was Jewish) in Kiev, Ukrainian SSR, Soviet Union now Ukraine. ↑ Quinn, Paul (9 November 1998). "Russia's New Icon". TIME. Retrieved 8 May 2013. ↑ Fisk, Robert (1999-03-31). "War In The Balkans: Primakov fails to end the bombing - News". London: The Independent. Retrieved 2010-09-28.